This FX-819 2.4G Remote Control Hand Throwing Glider is an innovative RC airplane with light weight but solid and strong structure. 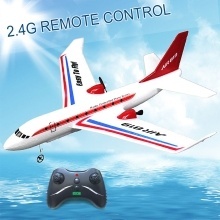 You can throw the glider by hand to experience different RC delight, or you can also DIY using electronic accessory to exercise ability and enjoy DIY delight. Perfect gift for kids. Note: There could be some deviations due to manual measurement or lightly color difference as the result of shooting scene.